Behold & Reflect: Asking Myself: What is the role of evil in a world created by God? 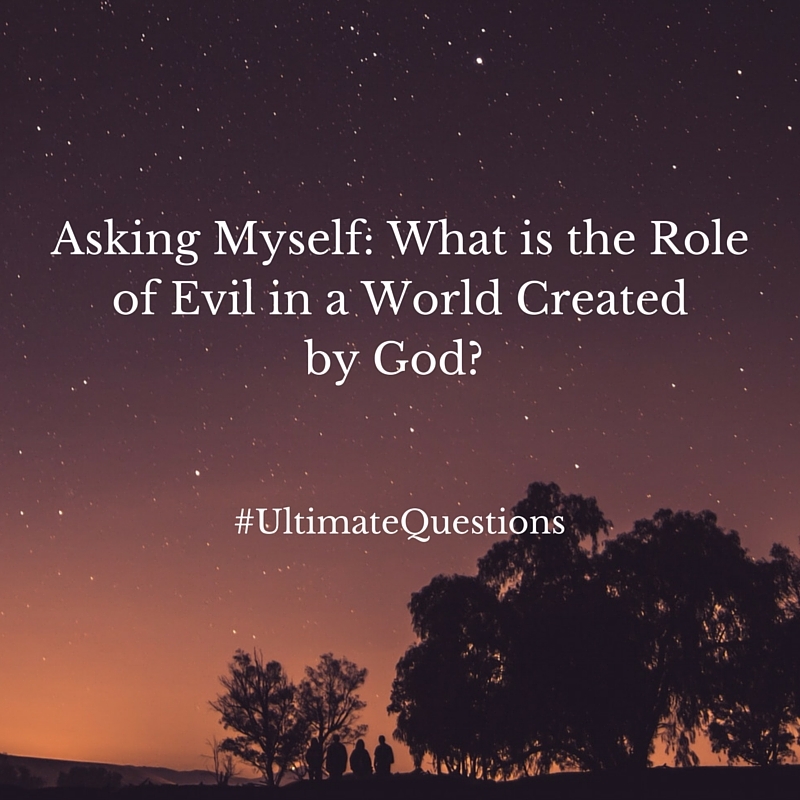 Asking Myself: What is the role of evil in a world created by God? This is the ninth installment of my series "Asking Myself," in which I weekly ponder one question posed in Teresa Blythe's rich book, 50 Ways to Pray. You can find the start of the series here and last week's post here. Q: What is the role of evil in a world created by God? This is a question that I find painful to ponder. It puts me on the edge, faith-wise. If I dwell too long on it, I'm prone to doubt either God's power or His goodness. But here it is, the last of nine theological questions presented in Blythe's exercise I've yet to blog about. First, I think I need to define "evil" in order to build my thoughts on evil's role. God is good, 100 percent. Could He have created evil? I hate to think so. And could He have created things to be innately prone to evil, fully knowing they would succumb to it or at least fall victims to it? That's a tougher question to answer. So instead I'm going to answer my first question about the definition of evil: Evil is the absence of God. Evil is anti-Christ. No God, no good. No good, evil. So what is evil's role in this world created by God? The word "role" connotes a purpose or intentional method or work. But I fear this might be giving Satan too much honor. The word "role" is what particularly bothers me about this question. Did I mention how much this question has bothered me? I'm going to add some more questions to this one-person discussion. I've established, in my own mind, that evil is the absence of God. But in what worldly forms does evil take its shape? What does evil look like? It looks like children dying of cancer. It looks like hatred-spewing, self-congratulating politicians. It looks the toll of depression, quietly taking an unfinished, unfulfilled life. It looks like systematized oppression, prejudice and injustice, holding down the weak so the powerful can amass more power. It can be cloaked in religion and self-righteousness. It can wear pride on its sleeve. Or it can be subtle and manipulative. It also looks like greed and gluttony. It could even look like willful ignorance and apathy. It is selfish and destructive. It looks a lot like the absence of Love. And I don't like to admit it, but of course, there's evil in me. And in you, dear reader. Evil is simply the opposite of Christ. The opposite of good and lovely and loving and lovable. The places and spaces where Jesus and His revolutionary Kingdom are shut out. The chilling void left in the absence of His glorious presence. It's a void, where Satan, ruler of this world, Father of Lies, Prince of Darkness, former angel of light, and all his minions dwell. That's evil. But, what, the question asks, is evil's role? I don't have a ready answer. Is it something like the role of the Law, given to us not so we could attain it or overcome, but so we could see who God is and how we pale by comparison? Does evil, by extreme contrast, help illuminate who God is? Is evil simply the inky backdrop for a brilliant God? I'm most inclined to choose this answer, but it's not airtight for me. If the purpose of evil is to show us who God is by smacking us around with what He is not, then does that mean a good, good Father conjured up a scheme show off His glory by unleashing hell? Is evil, as many Christians would interpret the Bible to say, God's chastising, His loving discipline? I certainly believe that logical consequences for wrong actions fall into this category. A stubbed toe is the consequence of moving too quickly. A damaged relationship might spin out from speaking too rashly. A financial pinch might stem from a selfish or short-sighted budget. Live and learn. But what about when our wrong choices have a negative effect on others who had no control of our actions? And what about senseless freak accidents? Natural disasters? "Acts of God"? What about systems of violence and oppression? Surely, these are manifestations of evil, and yet they are examples where the evil is not clearly teaching us any kind of edifying lessons. Does evil exist because we've all sinned, we were all once enemies of God, and some of us still, deserving unending torture for our un-Godness, for our evil? As evil beings, is it that any amount of evil we endure here on earth is far less than we deserve? I hate this kind of theology. I hate it because it does anything but illuminate a good God in whose image we were created. No matter how striking the contrast, it does not bring to light a Christ who is so very near and present in our sufferings. Or is evil really not so bad in the whole scheme of things? Is it simply a momentary lightness of affliction? A drop of unpleasantness in the bucket of eternity? I'd like to be able to believe this interpretation while simultaneously not minimizing the immense suffering people experience because of evil. I'd like to squish down the plaintive cry in the back of my mind; it rings out, "Why was this the only way for us to be made one with God?" And why must God have made us with such a minuscule capacity that even a drip feels like an ocean of evil? A blip seems like an eon? And yet, one may say, the ways of God are mysterious. And they are. I think God Himself is mysterious. Not because He enjoys being shrouded in enigma, but because there's just so much in Him and to Him that I've yet to know. My hope, my faith, is in that His vast goodness will wrap around and swallow up the weight of world-ravaging evil in such a way that in both the end and the means we'll see justice.